The financial systems of the yesteryear are gone. With financial technology becoming easily available and the technological revolution, there are plenty out there. Fintech is making pathways for professionals like accountants and bookkeepers who have massive amounts of paperwork to deal with. With the web evolved and technology galore, traditional financial systems are biting the dust. Not just due to the advancement of systems and technologies but from obsolete physical systems that pose a danger to security and reliability as opposed to digital systems. These systems are heavily undermined as they cannot take advantage of innovations in the digital world. An accounting department filing cabinet is one of those systems. An accountant is a professional that deals with taxation which makes it legislatively important, for starters. They also help with portraying the financial health of a business and evaluate credit worthiness. Measuring, processing, and coordinating financial information of economic entities is called accounting. It is the summation of an organization’s activities related to economics and uses information related for users such as creditors, investors, management and regulating authorities. The scope of this field is vast and, due to its broad usage, tax accounting and auditing are also a part of it. An accounting department filing cabinet is part of it’s processing and practices. Accounting is centuries old so it is not hard to understand the need for standards and regulations in this vast field. The 21st century practices differ from the last century due to the formation of bodies and other authorities that govern the laws of accounting such as GAAP or IFRS. Having been around for so long, the accounting profession is desperately in need of an upgrade to better fit into the digital era. For classification needs, an accountant needs to record all particular asset details and information. Like the accounting department filing cabinet, all records are known to the accountant and where they are stored. Like skeuomorphism, where models are made to depict real-time objects that are imitated, using century-old methods like cabinet systems pulls down the potential of an organization, thus making a profound impact that generally allows competitors to move ahead. The physical attributes are such as the cabinet versus digital filing. Depending on the requirements of an organization, the cabinet holds information that is vital for the progress of the business which leads to growth and development. 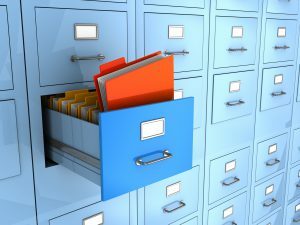 In a physical system, such as an accounting department filing cabinet, it is crucial to know where the information lies, which folder has it, which section it underlies, etc. Anyone who is assigned that task will be grateful and appreciative of how the data is stored, retrieved, managed and organized. There are many fields where data can be stored under categorization like copying papers and placing them in various places for ready reference but this practice is wild as workloads grow and paper management becomes a curse. To allow more freedom and ease in life, accountants use a prescribed system of account classification such as billing, costs, expenditures, and physical goods that help them acquire information readily unlike the accounting department filing cabinet. The digital era of our modern world has various concerns. Let’s take hashtags, for instance. Anyone on social media is aware of it while hash tagging pics of friends or a tweet. The nature of this is that hashtags are unstructured data in the domain of big data. It’s not compatible with accounting as structured data is used for financial reporting or training. Without reinventing itself, it cannot use hashtags as information organization but, upon realization of this problem, accountancy has to think up new ways to develop and grow to accommodate a modern world’s needs. https://www.completecontroller.com/wp-content/uploads/cclogo_main-long-300x63.png 0 0 Complete Controller https://www.completecontroller.com/wp-content/uploads/cclogo_main-long-300x63.png Complete Controller2019-02-08 13:17:012019-02-08 11:04:37What Belongs In An Accounting Department Filing Cabinet?